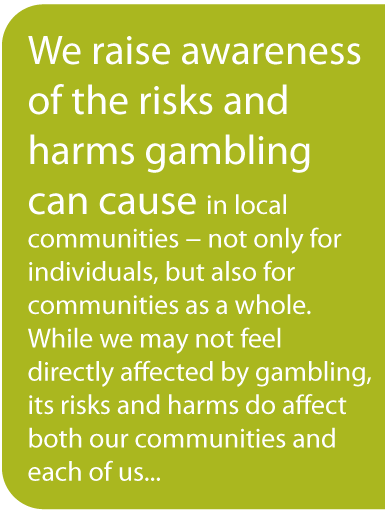 We usually think of gambling impacting only the person who struggles with over-use of gambling. 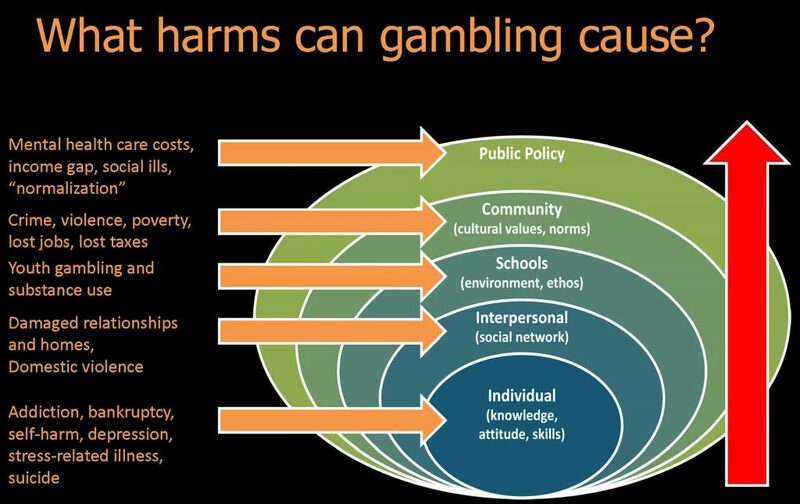 But gambling can cause problems on so many more levels. Individual: Dependency on gambling, susceptibility to substance dependency, personal bankruptcy, depression, stress-related illness, suicide. Relational (Interpersonal): Insufficient funds for rent, food, transportation or child care can impact the whole family. Disputes over these issues can escalate to domestic violence or divorce. Lack of funds for other social pastimes can result in social isolation, loss of friends. Organizational (Schools, local businesses, local not-for-profits, churches, etc): Schools sometimes normalize gambling to students by holding “Casino Nights” or fundraising using gambling with no information given as to the possible risks of gambling. What are we teaching our children? (See this video for teens’ repose to this.) Local business in Kings County loses out on $4 million in disposable income that goes to the province from VLT revenue each year. This could be spent locally, boosting the local economy. Some local churches and organizations have had money embezzled by employees hooked on gambling. Community (Kings County and its towns and villages): Dependence on gambling can lead to increased crime, increased violence, job loss, more costs to locally funded social services and so higher taxes to you. Society (Province and Canada): Increased costs for mental health care, justice system, social services will raise your taxes by far more than the province takes in from gambling revenue. Increased income gap as poorer people use gambling more than more affluent people do. An increase in the gap between poorer and more affluent citizens is directly related to higher levels of social unrest, community violence and crime. The “normalization” of gambling by it being supported and advertised and promoted by government, without sufficient warning of risks, can lead people to be unaware of the risks they are taking. Click here to see what we can do about these harms!